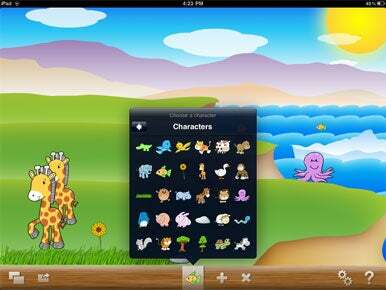 Picturesque is a clever $1 interactive iPad canvas for kids. You choose a colorful background, select adorable characters and objects to place on that background, and position them wherever you’d like. The app from Kelibo has plenty going for it. My 4-year-old daughter ran over to see what I was doing as soon as she heard its entertaining background music and sound effects. Picking a background was simple, and while tapping onto a character to place it took a little patience (because the tapping targets are so tiny), both my daughters and I found it fun to create scenes by placing giraffes, cows, sheep, flowers, octopi, and more all around the pretty, cartoony background we had selected. Image Ready: Place an image in Picturesque, and the iPad app will automatically adjust their size based on where you place them.